We're back with another epic version of The Hunger Games. Last time it was the Disney Princesses who fought to the death. But today I'm wondering, what if the cast members of The Jersey Shore all had to play? Why he'll survive... Vinny is the youngest and quietest member of the Jersey Shore. With his boyish charm, and smaller muscles, the other tributes might not label him a threat and forget he exists, thus allowing him to live long into the games and win. Why he'll die...With his boyish charm, and smaller muscles, the other tributes will label him an easy target and pounce all at once. Why she'll survive... Sammi will easily form an alliance with Ronnie. With his muscles and her quick punches, she will possibly make it to a dramatic end of the games that may or may not involve berries. Why she'll die... When Ronnie scouts out another tribute to kill, Sammi will mistake his scouting for flirting, burst into tears and run away... right into another tribute. Why he'll survive... Ronnie is buff! Plus he'll have Sammi as his ally! There are few tributes this man of brawn can't take down. Why he'll die... After his alliance with Sammi breaks he'll completely forget that he's NOT supposed to eat the berries. Oops! Why she'll survive... She is fierce and fiesty and will form quick alliances with everyone she can get her hands on. Why she'll die... She'll forget who her allies are/piss off her allies/get pissed off by her allies and kill the wrong person, thus causing every other tribute to turn on her and kill her. If she should survive this Angelina-cide, her big mouth/trail of trash will lead the other tributes to her camp. Why he'll survive... Like Ronnie, Pauly is pumped and if he can grab the DJ equipment from the cornucopia first, he'll create enough trance music to distract the tributes while he goes in for the kill. Why he'll die... Forming an alliance with another tribute, he'll realize too late that this "stage five clinger" is slowing him down and alerting the others to their location. Why she'll survive... She's amazonian tall and can pack a mean punch. Why she'll die... After trying to come between Ronnie and Sammi's alliance with an anonymous note, she'll be Ronnie's new target. Why he'll survive... The intimidation factor matched with his high score from the gamers will terrify the other tributes, sending them running even faster than they were from his cheesy pick up lines. Why he'll die... Showing off "The Situation" to another tribute in an open area, he'll forget that his t-shirt is bullet proof. Why she'll survive... Her extra poufy hair will prove a useful place to store food supplies and small weapons. Why she'll die... The gamers will lure her to a feast with the smell of pickles, after gorging she'll promptly fall asleep. Forever. Ok guys, what do you think? Who has the odds in their favor? Who will win or die? Haha I loved the reason Sammi will die. That's so funny. This is too funny...I actually think that it's between JWOW and Snookie. But, they'd have to have some poisoned gelato in their pockets or something because I don't think that they could kill each other...Well, maybe JWOW could kill Snookie. She's kinda ruthless. So, my money's on JWOW. This is awesome, by the way. Mrs. Deraps, thank you and I actually thought Snooki would be the victor. 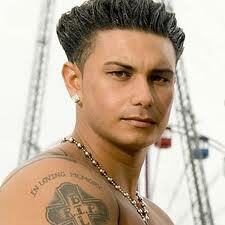 But JWOWW is a definite contender! Oh, and kudos for the reason Angelina will die. Dead on, my friend. Lol this is such a good idea! I reckon Angelina would go first, Snookie would probz have Jwoww to protect her. I actually think Sammi could win, If Ronnie does all the fights she could wait at a distance and finish them off when they have thier back to her. Or just give them a sammi sweetheart punch lol. Ronnie would probz die protecting her ... from Jwoww.